Continuing the Fall barrage of camera announcements, Nikon announced its newest DSLR on Tuesday, the D7000. This camera will sit just above the popular D90 and below the D300S in the company's DSLR line-up. 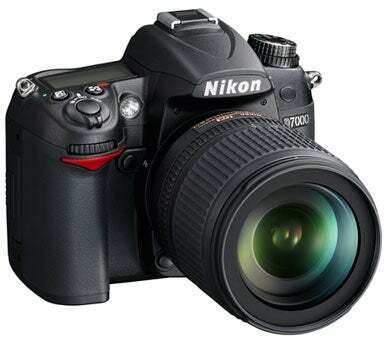 The D7000 has a 16.2 megapixel CMOS sensor, dual memory card slots, and a 39-point autofocus system. Like the Nikon's D3100 and Sony's a55, the D7000 shoots 1080p HD video with full autofocus capabilities while it's recording. At the touch of the dedicated movie button, video records as 1080p at 24 fps or as 720p at 24 or 30 fps. The camera can record up to 20 minutes of video at a time. While in video mode, it can autofocus on and track up to 35 faces. Clips can even be edited or trimmed in-camera. The addition of dual card slots will allow shooters to split up video and still shots, split up raw and JPEG files, or record to two separate cards simultaneously for an instant back-up. The camera records to SD, SDHC, or SDXC cards. Low light images get a boost in this model, with an ISO range of 100 to 6400 that's expandable to 25,600 in Hi-2 mode. Sports shooters can capture up to 6 frames per second (fps) in burst mode. The sturdy camera body has a 3-inch LCD screen that tilts 170-degrees, and an optical viewfinder with 100% coverage. Continuing the trend of increased in-camera image editing, the D7000 can process raw files in-camera and apply a host of retouching effects, including tilt-shift and color filters. Nikon is also introducing two new Nikkor lenses: a wide-angle 35mm, f/1.4 lens, and a telephoto 200mm, f/2 lens. The D7000 will be available in mid-October body only for $1,200, or packaged with an 18-105mm lens for $1,500. Updated 9/15/2010 at 9:40am to clarify that the D7000 does not directly repace the D90, but falls between a D90 and D300S.